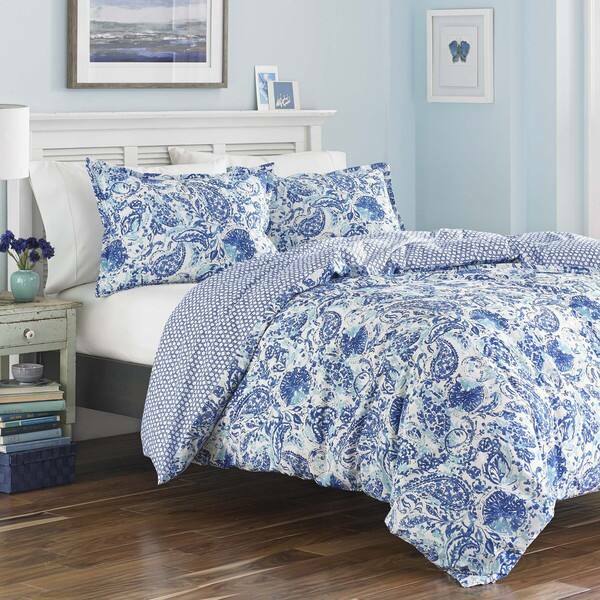 Add a bright and airy touch to your bedroom with this lovely duvet cover set. Crafted from stylish and durable cotton, the duvet cover features a striking cobalt and white paisley pattern front, and reverses to a geometric chicken wire design. The shams and duvet cover secure with zippered closures for easy and convenient use. This duvet is beautiful and comfortable. It's not super soft like a luxury duvet cover would be, but for the price, this is a win. The cobalt and turquoise colors are vibrant, and the pattern is lovely. It will brighten up your whole room. My favorite part about it is the zipper closure instead of the usual button closure that I find on most duvet covers. I absolute love this Duvet Set. 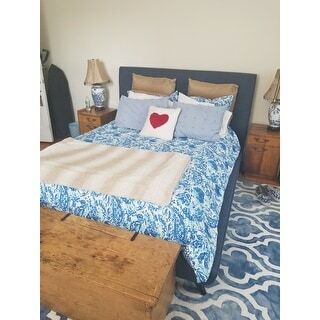 It is in my bedroom with the Safavieh Handmade Dip Dye Watercolor Vintage Blue/Ivory Wool Rug. My bedroom looks amazing so bright and happy...it is my favorite room in the house. Nice looking overall "floral"print with a reverse side geometric "chickenwire" type pattern. For the money, good value. Cheered up my bedroom and looked good against a navy colored headboard. Quality quite good and washes well. I could not be happier with this duvet set. The colors are just like they look in the picture - very bright and vibrant. The quality of the cotton is way better than I expected for the price. very soft and smooth. Another bonus is that the shams and cover close with an invisible zipper. I find that 'envelope' closures on shams are kind of sloppy but these are as neat as a pin. I highly recommend this set. the reverse side is little circles and adorable! This set is so super cute! The colors are bright and cheerful. I love the contrasting reversible backing of both the duvet cover and the pillow shams. Highly recommend!!! Lovely duvet cover, good quality and bright colors. I bought this for a guest room, and it is just what I was looking for. The flowery side is a little different than anticipated, but the reverse side is lovely and that is the side I was planning on putting on the top anyway. It washed nice and the fabric feels nice as well. Beautiful duvet cover set! Wanted to use it in our guest room. Blue and turquoise colors were lovely...however, they did not go well with the color palate that we had already started. Had to return the set...but...it was very nice!!! Beautiful - makes the room bright with color. Great fabric - very happy with this purchase. Was a birthday present for my sister who is in an Assisted Living. She loved it and it brightened up her whole bedroom! I am so happy! Fits great, is super pretty, but after it was washed, it is not very soft. The colors are vivid and bright! I am using it in a Tropical bedroom with light turquoise walls. Prefect! This comforter is beautiful. The ability to reverse it to an equally beautiful but different pattern is excellent. A whole new look for your room in an instant. Disappointed because the print isn't as vibrant as the photo. The blues look rather cheap. I have a brand new washer and dryer with steam and can't get wrinkles out no matter what. This duvet cover looks very nice on our bed. Good value for the price. It is a nice cotton, and we think will wear very well. The colors are as shown in the photo. I like that I can change the look just by flipping it over. Beautiful cotton fabric and the duvet has a hidden zipper versus buttons. It looks very nice on the bed. Disappointed about the colors and low resolution on the floral/paisley print side. Looks cheap. I didn’t open this product until it was past the time to return. "Is this a sateen weave?" This is a plain cotton weave, it is not a sateen. I hope it helps. "Are there internal ties on the corners?" I liked the bright colors and pattern. I love the many shades of blue. So pretty! "Does the duvet need ironing after washing or does it appear pretty wrinkle free?" This is 100-percent cotton, works best if you take it out of the dryer before it is completely dry and run the iron over it. 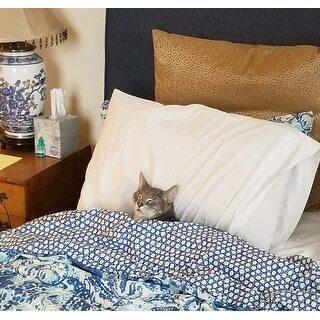 "Is the duvet cover very soft?" Not really. For the price it's okay. It is fairly stiff, I have only laundered it once, I would assume with more use and laundering that it would soften up more. That has been my experience with other duvets/sheets in the past. "Where can you buy the matching pillows?" "Can you buy the matching pillows that go with the duvet cover that are pictured?"